We boarded the boat just after 5 p.m. It was large, complete with a covered downstairs and a roof-deck full of seats. The sun had begun its descent but was still high, and bright light reflected off the ocean waves below us. 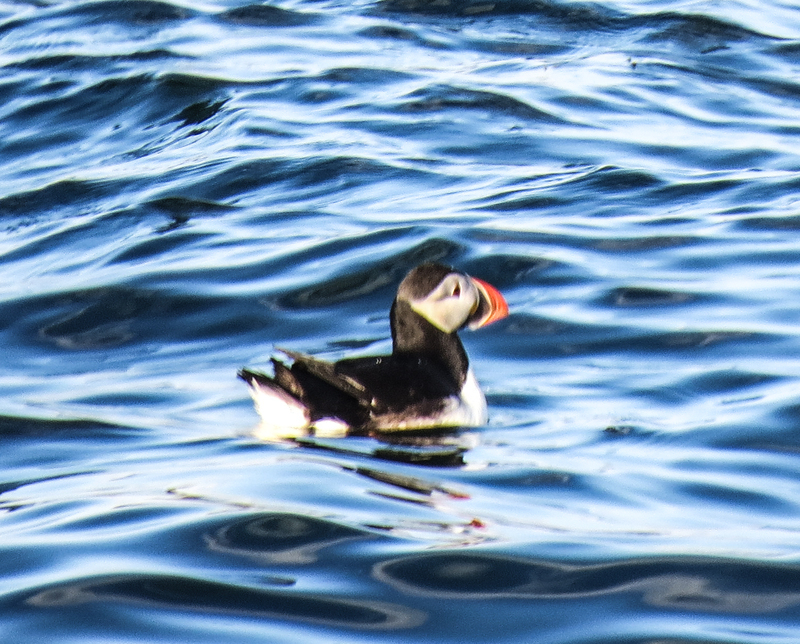 Hardy Boat Cruises had been running tours for years from New Harbor, Maine, and as the visitors piled into seats we all had one image in mind: Atlantic Puffins. Puffins, also known as “parrots of the sea,” are black and white seabirds, about the size of a football and known for their large yellow, orange, and black bills. Make no mistake, they are absolutely adorable, and look like an animated Disney creation. 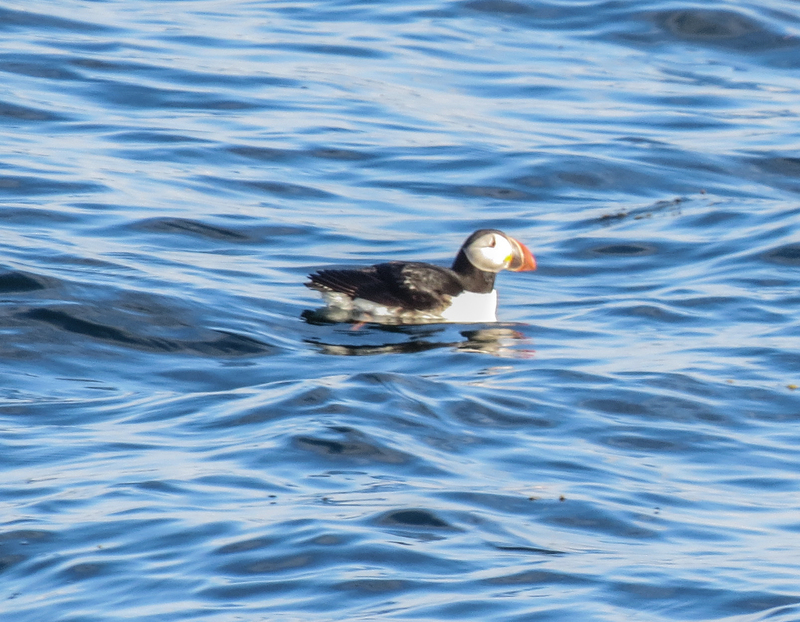 While puffins used to be plentiful in Maine, hunting and egg collecting took a heavy toll. The last of the nesting puffins on Eastern Egg Rock – our evening destination – disappeared in 1885. 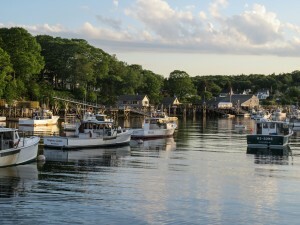 For many years, puffins only nested on two islands in Maine. Until, that is, a few brave and intrepid souls decided to make it their mission to restore breeding colonies of puffins on Maine islands. Project Puffin was born in 1973, when puffin chicks were literally transferred to Eastern Egg Rock and fed by biologists. Since puffins spend a few years at sea before beginning to breed, wooden puffin decoys were put on the island to encourage their return. And return they did! 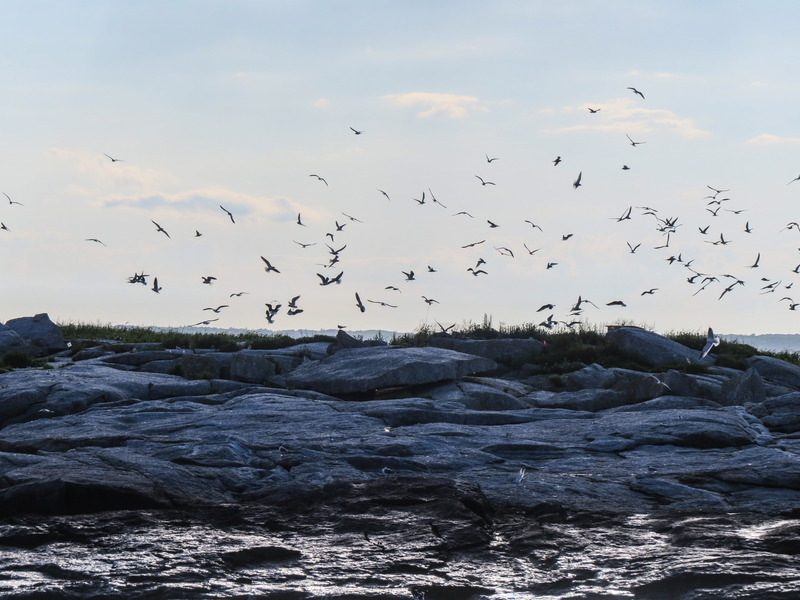 Beginning in 1977 Atlantic Puffins once again laid their eggs on Eastern Egg Rock, and there are now over 100 nesting pairs, raising the Maine total to nearly 1000! It was the descendants of these and subsequent transplants that we hoped to see on our evening excursion. 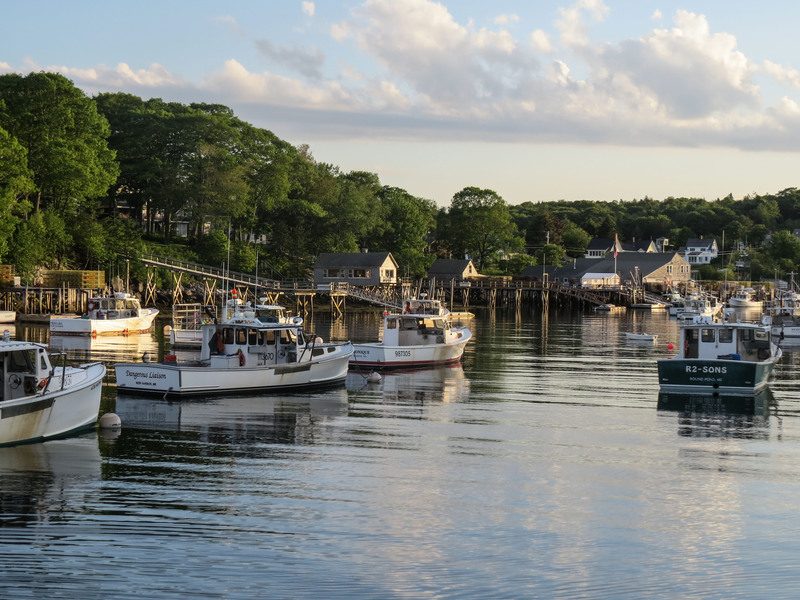 The boat pulled out of the harbor, quickly moving past Maine’s picturesque, rocky coastline and out into the open water. We passed porpoises, lobster buoys, and Harbor Seals, making a bee-line for Eastern Egg Rock. 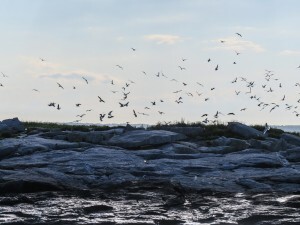 Even before we reached the island we began to see birds: Black Guillemots with bright white wings against their black bodies, loud Laughing Gulls, diving Common Eiders, and nesting Common Terns all flew back and forth from the island and swam and dove beneath the waves. Common Terns nest in great numbers on the island as well, as do Roseate and even Arctic Terns in fewer numbers. Other than the birds, we also saw researchers on the island, wearing slickers to protect them against the hail of bird droppings. We all stood at the edge of the railing, practically hanging over the side to get a good look at the little bird. There were a few very high-end cameras on board, and I heard the rapid click-click-click-click-click as they got the shots we had all hoped for. Make no mistake, puffins are cute! 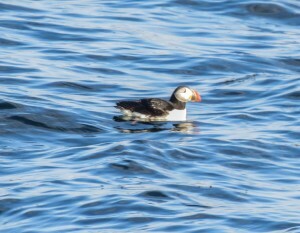 The boat slowly circled the island, and we saw many more birds, including six or seven additional puffins, one of which stayed quite near while we admired its plumage. As I watched them, I was constantly reminded that a few decades ago such views would have been impossible. In a world of negative environmental news, I loved seeing the feathery evidence of a success. Working to restore the nesting site was both difficult and time consuming, but should inspire others tackling difficult conservation issues!